Martin Elworthy started shooting at the age of seven with a .177 air rifle and within the year he had progressed to a .22 BSA Airsporter. Recognising his passion for shooting and a natural ability, at the age of nine his father gave him a Webley & Scott 410g single barrel shotgun which Martin used for ferreting and rabbit shooting - much to mother's disgust. It was this gun that opened Martin's eyes to the real world of shooting and he relentlessly pestered his father for the next 18 months for a 12 bore - finally, one Saturday, father threw down his tools, jumped in his car and took Martin to buy the 12 bore of his dreams. Martin Elworthy mid Cornwall firearms was set up to enable Martin to share his passion and unequalled experience of shooting with the general public and the rest of the shooting fraternity. This is a traditional gun shop with the widest range of new and used guns in stock along with all the country apparel that is needed to support the sport. The gun stock at the shop suits all interests, all levels and all budgets. 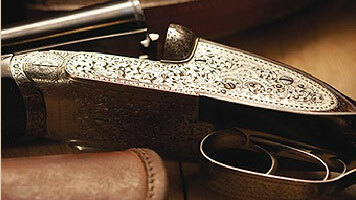 We regulary have a unique and collectable pairs of shotguns from the turn of the century and we also stock the most modern Berettas and the like. We have a wide range of sporting and hunting rifles of all calibres along with a broad selection of scopes and moderators. We also cater for all levels of air pistols and rifles. Martin Elworthy mid Cornwall firearms offer a full gunsmith service and the shop is manned by a friendly and knowledgeable staff that are happy to guide you through the purchasing process. If we haven't got the gun or accessory in stock then this is usually available on a next day delivery and if there is something special that you are looking for, then this can usually be sourced through our wide base of international contacts. "a traditional gun shop with modern levels of service"